The Holy Roman Empire of the German Nation, around 1625. The Thirty Years’ War is underway and military leaders like Wallenstein or Gottfried Heinrich Graf zu Pappenheim are roaming the country, fighting and looking for their odds. The leader who has collected the most victory points by controlling counties and building premises will be the winner at the end of the game. Battles are fought using the dice tower, no matter if the leaders fight against each other or against the peasants. That way thrilling battle results are always guaranteed. EDIT: This was my first review. It has been revised to upgrade it to the level of my other reviews. Wallenstein takes place in Germany during the Thirty Years War in the early 17th century. Wallenstein and other warlords marched around the countryside of what is now Germany seeking land and power. Players take on the role of one of these warlords. The theme is somewhat represented in the game. However, there are no faction abilities, no different types of army units, and no in-depth political intrigue. The object of the game is to acquire the most victory points (VPs) by dominating regions of the board through conquering counties (territories) and constructing buildings. Wallenstein is for 3 to 5 players ages 12 and up and plays in about 2 hours. Wallenstein is at its best with 4 or 5 players. The component quality is very good. The game board is large and mounted on thick cardboard. There are thick cardboard tokens and player boards, wood playing pieces, a linen bag and somewhat durable small size cards. The artwork on the boards and cards is average but sets the theme. Unfortunately, the rulebook is not well written and organized, and unclear on some aspects of play. There is also a supplement rulebook which contains a rules overview, beginner army set-up tables, information on the cards and rules for one of the two expansions included in the game. Much of the information in the supplement should be in the rulebook, and if the rulebook was well organized there would be no need for the supplement. This is one game I needed to put together my own rules summary to get game play right. The game includes rulebooks and supplements written in about a half dozen languages. There’s a whole lot packed into the box! Set-up for Wallenstein takes a moment or two. Each player receives a player board, playing pieces in his color of choice, turn order bidding cards and starting Thalers (gold) depending on the number of players. Players place their armies in counties according to a balanced beginner set-up table in the supplement. If using the advanced set-up, then players take turns drafting counties. This method can take 30 minutes or more. Once armies are placed, some miscellaneous tokens are placed on the board and the dice tower is assembled. The final step is to seed the Tower with the players’ and farmer armies. Wallenstein would be much easier to learn and play with a better rulebook. Even so, it is still fairly easy to learn and play. I would consider Wallenstein to be a medium weight game but still not suitable for casual gamers. It takes a few plays to learn the strategies and tactics. 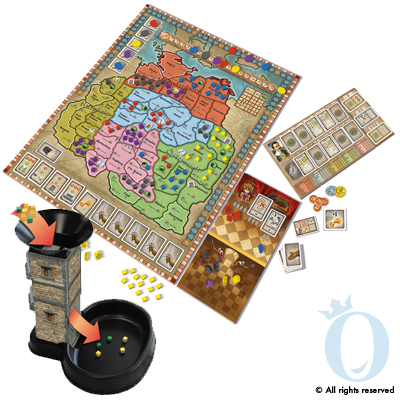 Players must be very mindful of their gold, the amount of grain they have collected and their standing in the various regions on the board. Wallenstein is a Euro/American style hybrid also known as a ‘Wuro’. It sports player conflict featured in American style games with planning and bidding mechanics of a European style game. The dice tower, which is a unique mechanic, was introduced in Wallenstein. The Tower essentially replaces dice for resolving combat. The Tower really streamlines combat, creating little downtime, and injects excitement into the procedure. All gamers should experience the thrill of the Tower at least for one play! Wallenstein blends many mechanics, such as the Tower, area control, variable turn order, hidden orders and bidding, together well in a very elegant design. Yes, luck can be a factor in Wallenstein. There may be no dice, but the fall of the army cubes through the Tower can make or break a player. The draw of the orders and the events can also inject luck into the game. However, these mechanics also give the game a great deal of replayability. And in the end it really boils down to how well players plan their turns more than luck. Wallenstein is an elegant and unique game which delivers an interesting and fun gaming experience! It is a very engaging game which makes time pass quickly. As a hybrid game, it could bridge the gap between the tastes of players in a gaming group. Wallenstein would make a great addition to your collection and I highly recommend it to avid and power gamers. Add a Review for "Wallenstein"